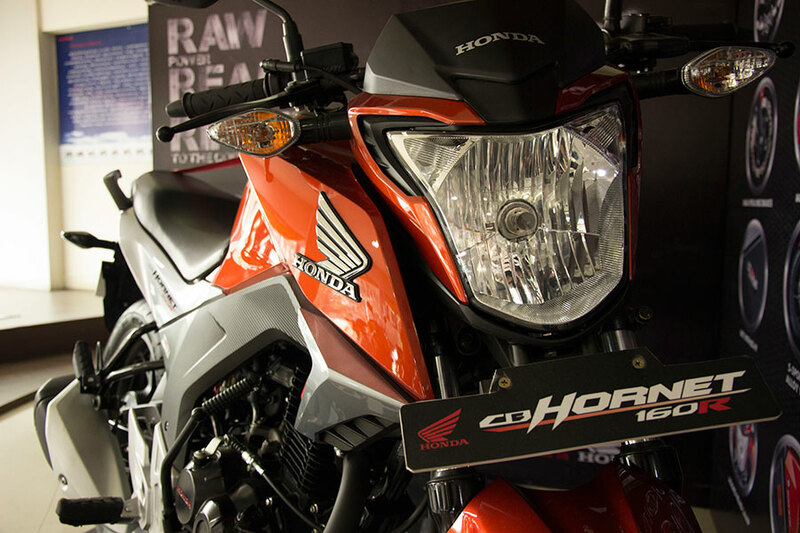 The all new CB Hornet 160R was first previewed at Revfest event which was held across different cities in India last year(2015). It has been over a month since the bike has been introduced to Indian market and we got a chance to test ride and review the Hornet 160R pretty early in Bangalore. This bike which comes under 150cc + category comes with a very stylish and refreshing design. CB Hornet 160R is the second offering from Honda in the 160cc segment, the first one being Honda Unicorn 160 which we reviewed last year. The addition of Hornet 160R to 150cc + portfolio indicates Honda is strengthening this particular segment and is also providing more options for its customers, especially for those who crave for style, design and power. The bike comes in standard and CBS ( Combi-Braking System) variants. The one which we will be reviewing today is CBS version of Hornet 160R. The Hornet 160R is available in 5 different colors, and we got the Neo Orange Metallic color, the one which Honda has used across all its promotional materials. We felt that Neo Orange metallic is a pretty appealing and attractive color that gives this bike a pretty decent and prominent look. 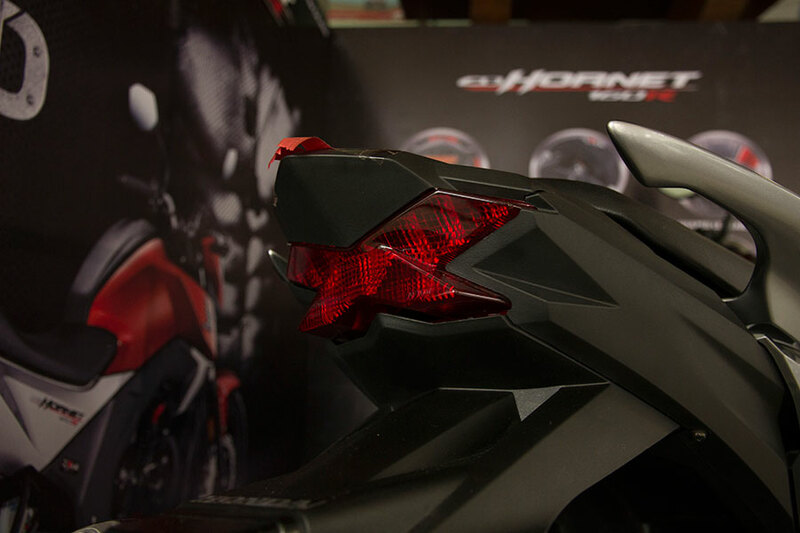 At the front, Hornet looks very muscular (even better than Unicorn) – all thanks to the well designed fuel tank. The Aggro headlamps, stylish X-shaped LED taillamp in the rear and a very distinctly looking compact Muffler with silver finishing adds value to the design aesthetics of the bike. 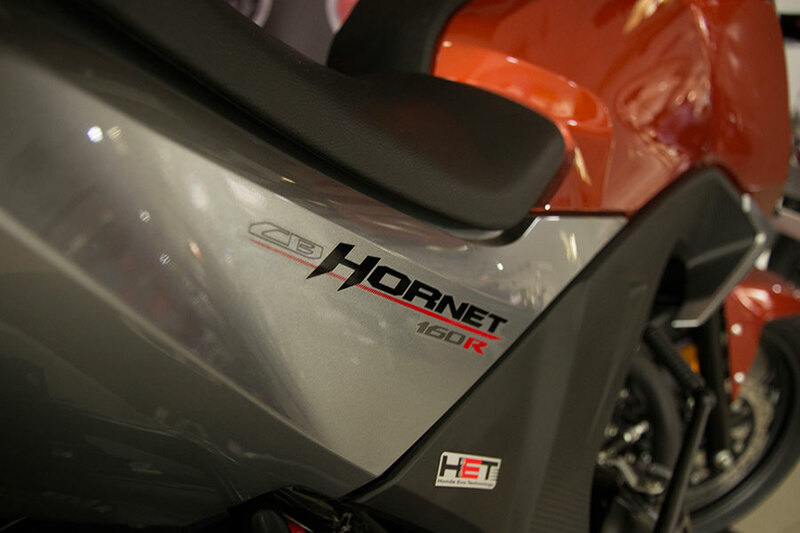 Hornet 160R is powered by air-cooled, 4-stroke, SI engine. The engine capacity of this bike is 162.71cc and is mated to a 5-speed manual transmission gearbox. The spec sheet of Hornet 160R reads a maximum power of 11.68 KW @ 8500 rpm with a torque output of 14.76 Nm @ 6500 rpm. The bike can attain a maximum speed of 110 Kmph. We almost reached the maximum speed during our ride on elevated highway en-route the test ride location. Manoeuvring through curvy roads at both slow and high speeds were quite satisfactory and we cannot comment on cornering aspect as we didn’t try it during our review. As we discussed earlier, it is the CBS version of Honda Hornet 160R which we drove – and we are clearly able to experience the power of instant braking. The braking system is above the par than any other Honda bikes which we drove in the past – the bike stopped pretty confidently whenever braking is performed, even at the high speeds – a real positive experience for the rider who negotiates the city traffic. 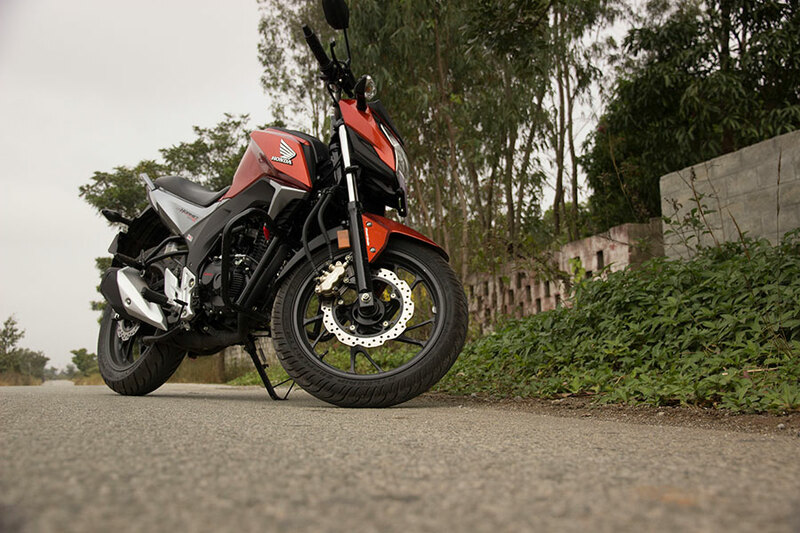 We drove the bike on different terrains – the city roads, country roads and muddy un-asphalted roads. We could literally notice the suspension system working whenever the bike passed through rough and stoney surfaces. Negotiating road humps were not a problem at all. Thanks to telescopic suspension at the front and mono-shock absorbers at the rear. Riding with pillion rider was comfortable, the only issue which bothered us was the sharp edge near seat holder – which could hurt a bit whenever you are hooking on to the bike. The ex-showroom Bangalore price of Standard version of Honda CB Hornet 160R is 81,249/- and the CBS version of the bike is 85,749/-. We think this bike has got all the charm which one could expect in an ideal bike, especially the power and design. The bike is very aggressively priced to take on its rivals in this segment like Pulsar AS150, Gixxer 155, Yamaha FZ and others. The bike scores well in all the departments – performance, riding experience, handling, braking and suspension. If you are looking for a powerful brand new motorcycle from Honda under l lakh rupees – you can without doubt go for this new Hornet 160R. We would also like to mention the use of BS-1V type of engine in this bike that is environment friendly and conforms to emissions norms. So you should not be feeling guilty of polluting the atmosphere. What do you think of this bike? Let us know! Get Honda Hornet 160R for Test Drive!